Caramel Wings: Food Review : Good things come in small packages. Royal Sindh, Versova, Mumbai. the partition and brought with them this wonderfully rich cuisine, both in terms of flavor and fragrance. Sindhi food is something which is very specific to Sindhi households, and everyone has their own way of tweaking things. 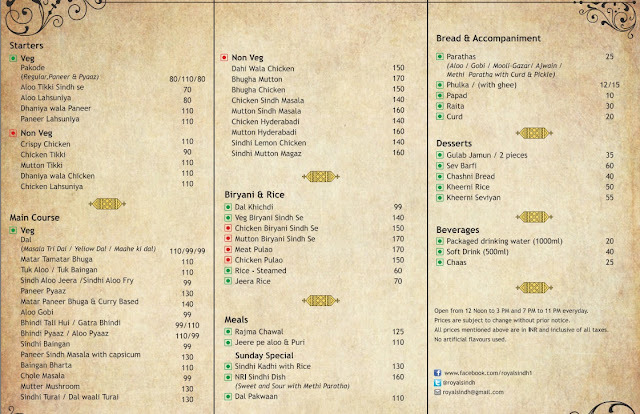 This could be one reason why we don't see too many Sindhi restaurants around. 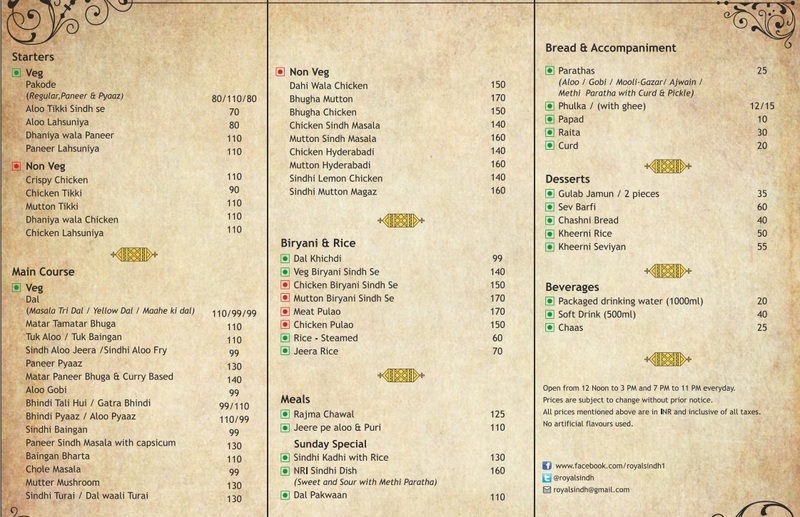 I was very happy to find Royal Sindh opening up in my neighborhood. We started off with Paneer Lahsuniya, Aloo Tuk, Crispy Chicken and Mutton Tikki. 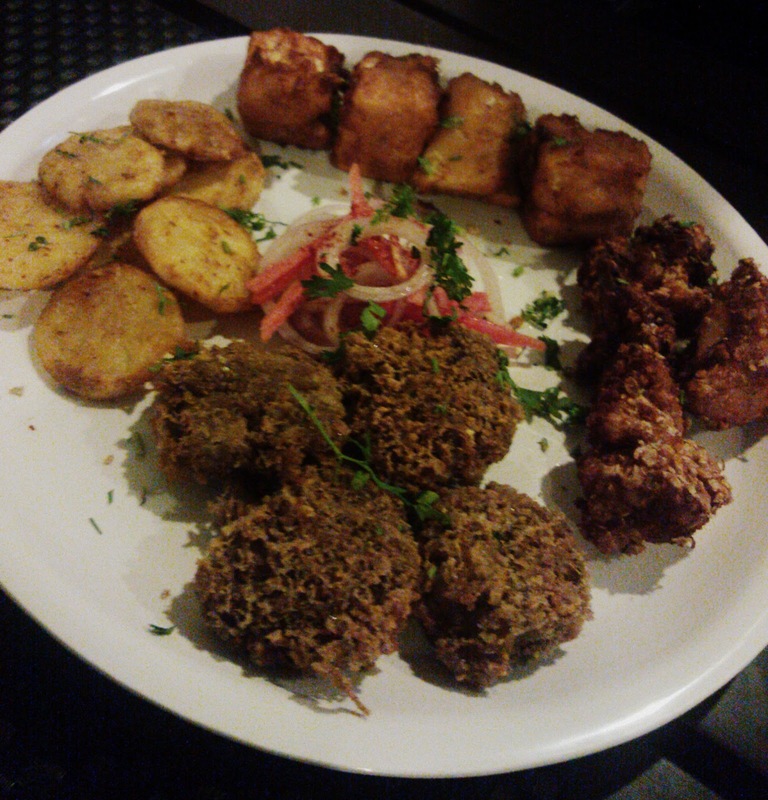 The Mutton Tikki was nice and the meat was not rubbery, but the flavor wasn't extraordinary. The Crispy Chicken could give KFC a run for its money, the Aloo Tuk reminded me of my ex neighbor lady who used to always send us a plate filled with those whenever she made them at home and the Paneer Lahsuniya was absolutely fantastic! Melt in the mouth Paneer Chunks with a Ginger and Garlic filling sandwiched in between them, dipped in thin batter and fried to crispy perfection. It was heavenly. Next up was Tali Bhindi, Matar Mushroom, Mutton Magaz and Dahi wala Chicken with Mooli and Gajar ka Parantha. The Paranthas were ridiculously small in size but the flavor was spot on. The Mutton Magaz had meat that was well cooked but it seriously lacked flavor, maybe some salt, but it was good. Matar Mushroom is one of my most favorite dishes and even though the dish was perfectly cooked and had great flavor, it did not have those perfectly cooked peas that burst in your mouth with the slightest pressure from the palate. Tali Bhindi was just like Mom makes at home. We then moved on to the Meat Pulao which was just as promised, Meat Pulao. Mildly flavored with spices, the Meat Pulao was good enough for someone like me who does not like a lot of hotness in food all the time. But maybe I will try the Biryani next time! 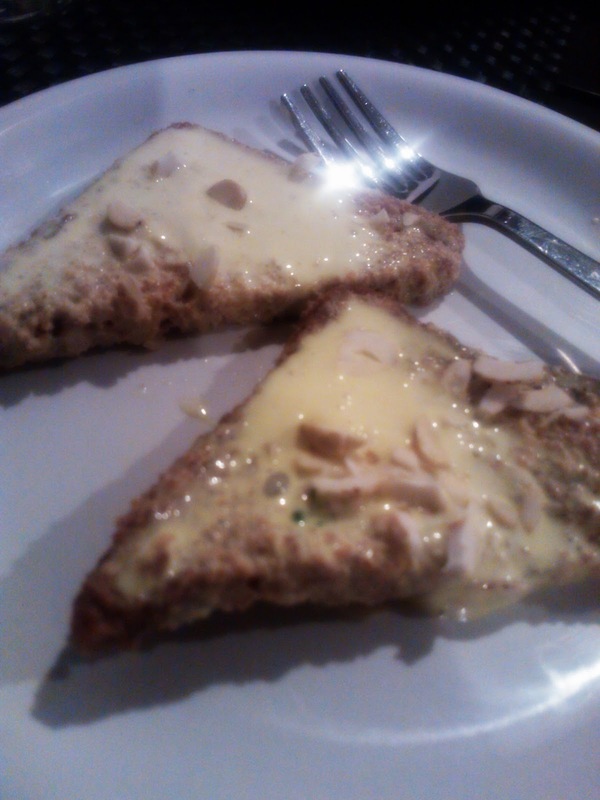 Dessert was Chashni Bread and it was omnomnom yum! Wished the presentation was a little better though! A special mention for Royal Sindh's Sunday Special items (which I did not get to taste since I was there on a Saturday night) that include Sindhi Kadhi, Dal Pakwan, Koki and Sai Bhaaji. All these dishes are the ones I love the most from the Sindhi cuisine so I really wish I could have them any day I wanted! All in all, Royal Sindh is off to a good start. Minor fixes here and there and they will be unstoppable! cant wait to try this place.great post! I liked your post..Awesome review it is! Being a sindhi, I have eaten many of the above things at home, but the place seems worth visiting..
Thanx for recognizing sindhi food and sindhi restaurant.. I read your "about me" and other posts..
must say a nice place it is..